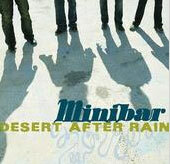 I still don't know how Minibar--originally from the UK--manages to sound more authentically American than many other domestic alt.country outfits, but they do. With a sound less rambunctious than Old 97's, vocalist Simon Petty fills these moody tunes with a likeable longing. He also squeezes out his words a little bit like The Blue Nile's Paul Buchanan, although these tunes have much more of a bounce than anything The Blue Nile ever recorded. You get the impression Petty always sees something bad about to happen; something just beneath the surface. Sometimes he just comes right out and says it. For example, how can a line like "They wrapped your house in crime scene ribbon" be anything but bad? Petty may be of the suspicious sort, but Desert After Rain nevertheless conjures up enjoyable musical paranoia.